I am taking a medication, Femara, to prevent future cancer. It makes me feel as if I am pregnant – some nausea and dizziness, plus I feel as if I want to curl up and go to sleep. I hope that these symptoms become less agravating over time as I am supposed to take it for 5 years. Today I got a call from the breast cancer aftermath coordinator (my title for her). You know – the syrupy sweet, I feel your pain, type. I have been in serious denial. Had a meltdown when I had to think about bras and prostheses and such. I just want to do some creating and don’t seem to have the energy for it. I spent 6 hours doing quarterly updates on the SDA website yesterday and today. Now I am struggling to get the church newsletter formatted – but I have until next Monday so I shouldn’t be stressing. 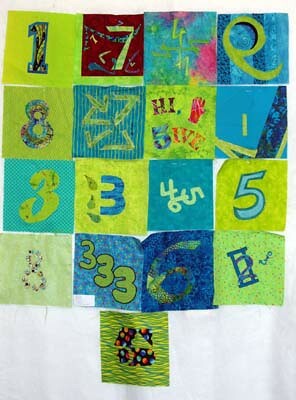 I have four great quilting friends ?����� we call ourselves the Fab Five. Yesterday four of us travelled to San Jose to see the Quilt National “03 exhibit at the San Jose Qult Museum. Diane, our youngest member always drives – she has a car that can comfortably seat us if we put our smallest member – Pat – in the “Way Back”. Yesterday, Rita didn’t go (and we missed her very wty sense of humor) so Pat got to sit with the grown-ups which includes Janet, our most senior member – she is 80 and been around more than one quilting block!! Usually we run into several people who know her. The Quilt National Exhibit was very interesting. This show is very cutting edge quilting. It is held every two years and it is extremely difficult to be juried in. 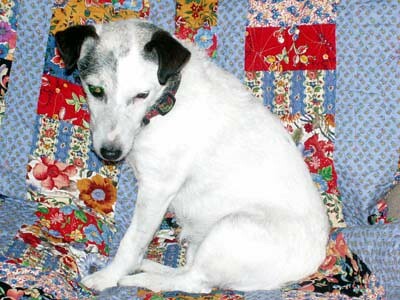 Janet had a quilt in the show way back in the beginning years so she is our celebrity member. 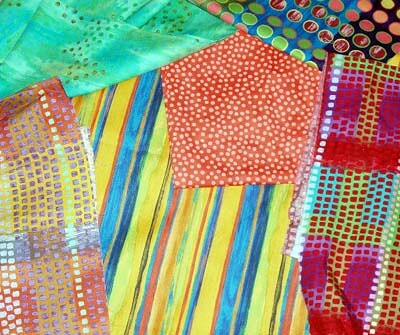 We visited a couple of quilt shops and Thai Silks in Los Altos. 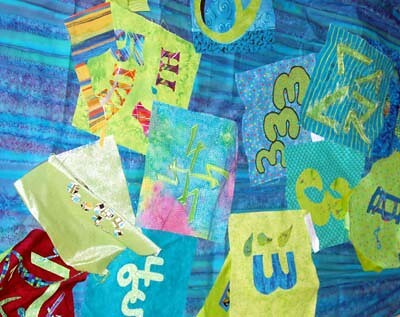 I purchased some great fabrics and lots of green silk for a long and narrow quilt banner I am designing for the green season for Church of the Incarnation. 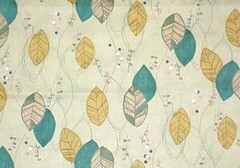 This will also be in the Straight and Narrow Challenge on the Quilt Art List. I found this lovely Japanese fabric and bought a yard for my daughter, Stephanie because it was screaming her name. Spending time with friends who share your passion is the best! 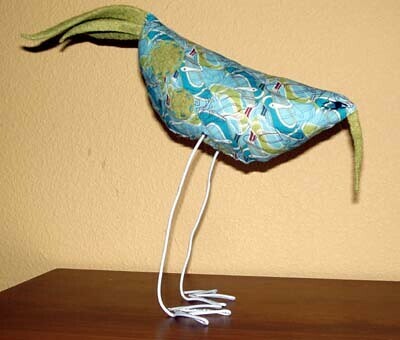 My daughter Lisa creates and makes wonderful birds from awesome fabrics. She has a blog devoted to these birds – Modbird. I received this one in the mail yesterday. 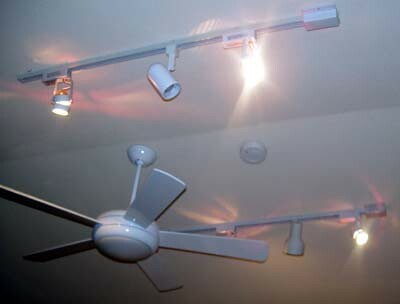 Steve installed the new track lighting in my studio while I was away from the house. This always makes me nervous. I am a firm believer that ladders, electricity and husbands can be a dangerous mix. But here they are – all matching and shedding new light on my work space. This morning I had to see my oncologist. He is having me take Femera, the drug that has replaced Timoxifin, to inhibit any future cancer. I also had to have several tubes of blood drawn – a really joyful occasion. This afternoon Stevie and I took a ride down to Petaluma to the Silver Penny Ranch so that I could retrieve a favorite Chico’s jacket that I had left over the week-end. Then we went to a lighting store to pick up new trac lighting for my studio. 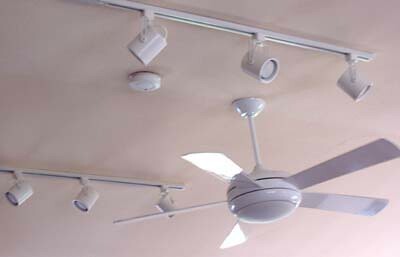 Here is the pathetic lights I have now – they are mismatched and keep burning out. So tomorrow while I am presiding at the guild board meeting, Steve will install them. Here is a photo of Maggie who hangs out in the studio with me. She is very quiet except when she hears a UPS or Fed Ex truck! She loves to get packages as much as I do!! She is 10 years old. We acquired her when we lived in North Carolina. She is a Jack Russell Terrier named after Margaret Thatcher because she is a British female who can stand up to the good ole boys. Now I am going to work on the guild newsletter and watch the Project Runway finale.